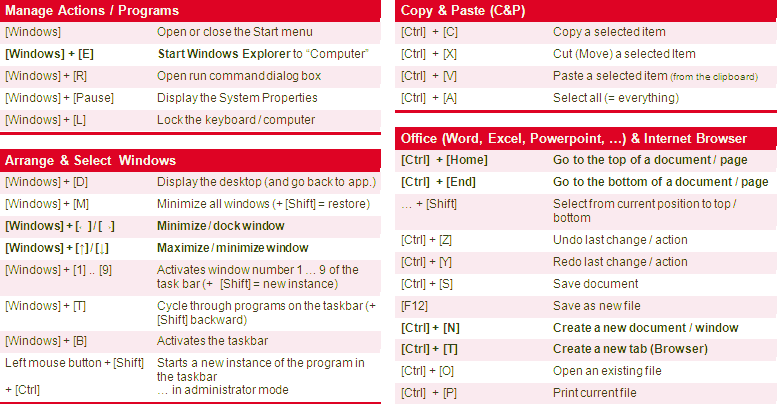 Some tips & tricks: this page presents a selection of the more useful windows shortcuts - about 77 - still to many to memorize all of them. However, the pre-selection, which ones to consider, corrolates closely with the users habits. The shortcuts have been tested with Windows 7, and are thus most likely usable with the successor versions (e.g. Windows 8). Concerning the predecessor version as Windows XP, there are some known failures. Start Windows Explorer; path "Computer"
Arrange files in Explorer via "Sort by ." Explorer Command "Open with ." Delete item directly (without recycle bin) - Not recommended these days! The mostly system-wide usable Windows Keyboard Shortcuts - Tips & Tricks. from this page can be downloaded as a PDF (Cheat Sheet). To the left is a screenshot (fragment only) to provide an impression of how is looks like (a click will enlarge the image). use F1 within the Explorer, type "shortcuts" into the search box, and you are done.